John McCain breaks world record for "dumbest thing you can say about a foreign leader." 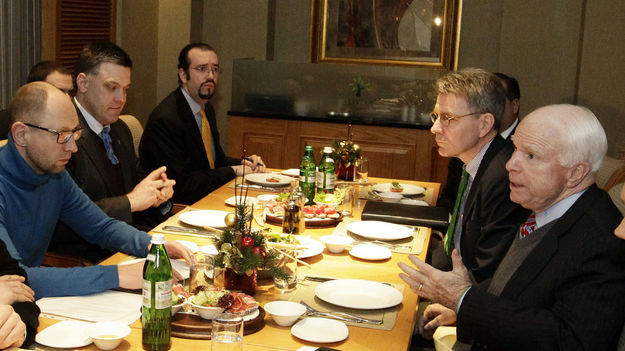 Hungary's Foreign Ministry summoned the U.S. envoy on Wednesday after U.S. Senator John McCain called Prime Minister Viktor Orban a "neo-fascist dictator." The United States has become increasingly critical of Orban's government, accusing him of getting too close to Russia since east-west tensions rose over Ukraine. I am speechless. Pot calling the kettle black? See photos below to understand who is really hanging out with “neo-fascist” elements. Hungary’s foreign minister called in Chargé d’Affaires André Goodfriend over McCain’s comments, made in the U.S. Senate during a political spat over the appointment of Hollywood producer Colleen Bell as U.S. Ambassador in Budapest. Bell has since been approved in the Senate and is expected to take up her position in Hungary. “The Hungarian Government … rejects the words of Senator John McCain regarding the Hungarian Prime Minister and the relationship of Hungary and Russia,” Foreign Ministry State Secretary Levente Magyar told national news agency MTI. He added that the Hungarian embassy in Washington would contact McCain’s office to inquire about the Senator’s words and their background. Breaking bread and plotting next moves before the coup in Kiev. John McCain with Arseny Yatsenyuk, and Oleg Tyagnibok. McCain’s having a post dinner chat with Arseny Yatsenyuk and Oleg Tyagnibok. 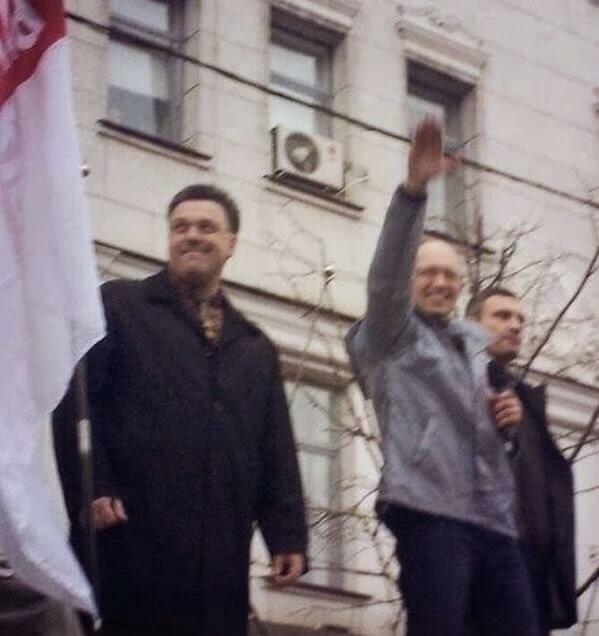 McCain’s dinner guests from above, Arseny Yatsenyuk and Oleg Tyagnibok wave, or salut, the crowd in Maidan. That’s not good for McCain’s reputation. 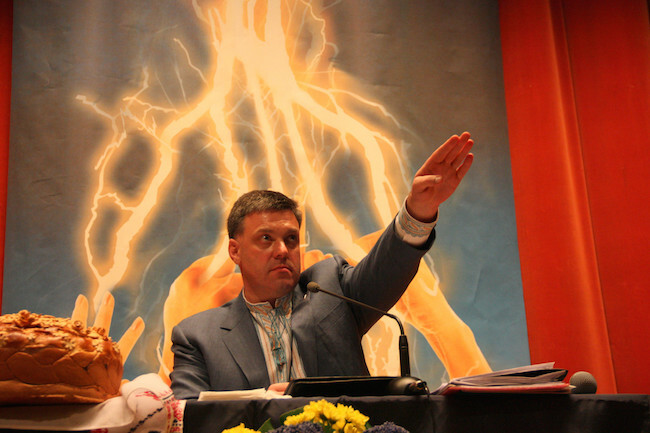 Oleh Tyahnybok saluting the crowd in a speech where he claimed a “Moscow-Jewish mafia” rule Ukraine and that “Germans, Kikes and other scum” want to “take away our Ukrainian state.” Read more about this here. 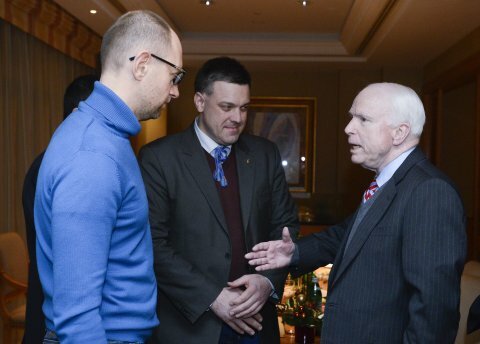 McCain, at Maidan, right before the coup he helped put together with his “neo-fascist”dinner guest from above.